We hadn't intended to come here. We were on our way to see the Durutti Column at Norwich Arts Centre, and our plan was to make a wide, stopping curve up from the Suffolk border through the parish churches of those pretty and remote villages, making landfall in the big city in early evening in time to eat and go to the pub before the performance. We'd started at Stratton St Michael, an open, friendly, welcoming little church in a delicious graveyard not far off of the A140. I was pleased to be there. But it was the only village church I would see the inside of all day. After that, they were all locked; the keyholders, where they existed, were out. We ploughed on, through Tharston and Forncett St Peter, both locked, and neither with any possible reason to be so. The sad ruin of Forncett St Mary needed no keyholder, but at Tacolneston, an otherwise large and prosperous village, the poor little church was unkempt and dilapidated, and locked, of course. It was a disgrace. Around those parts, nobody seemed to care. At Fundenhall, the next village, the church had been closed for six months, and would be so for the foreseeable future, as the sign put it. The building was in a dangerous state, and inaccessible. Thousands of pounds were needed for repairs, but nobody was interested. Next was Ashwellthorpe, a building of national importance; but again, the church was locked, and the keyholders were out. Why on earth wasn't this church open? Did it denote a lack of self-confidence, or boredom, or mere laziness? Next was Wreningham. It was early afternoon, a hazy sun high and the birds all singing. Again, this was a lovely spot - but, once again, the church was locked. I didn't even bother to ring the keyholder this time. "Sod this", I said to Jacqueline. "Let's go to Wymondham." And so we did. Wymondham is a busy, pretty town, near enough to Norwich to inherit some of its metropolitan airs and graces, but remote enough to have a sense of independence. There are a couple of decent pubs, and the two main churches, bless them, are both open. It was a civilised respite from the mean-spirited parishes we had just trawled through. Wymondham is most famous for its Abbey, of course, which is to say the former Abbey church, a Catholic church before the Reformation and now the Anglican parish church. Its twin towers are visible for miles, although the low site on the outskirts of the town centre means that you could wander around the shopping streets without knowing it was there. We knew, of course, and we planned to go there; but first I decided to dispatch some unfinished business. A couple of months previously, I had visited Wymondham Catholic church with Peter Stephens, but a rehearsal had been in progress for a concert, and I hadn't been able to take the photographs I'd wanted. So we went there now. 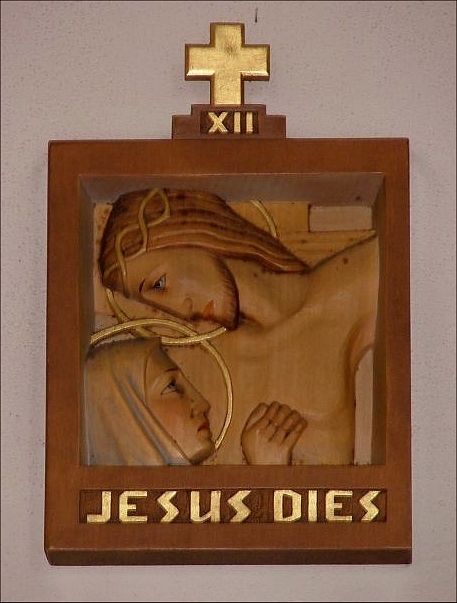 Today, the Anglican parish church bears a dedication to St Mary and St Thomas of Canterbury - and, with the modification of the first Saint into 'Our Lady', so does the Catholic parish church. I cannot think of another occasion in East Anglia where the Anglican and Catholic churches of a town share the same dedication. It is as if two rival football teams played in the same colours. Not that I would want to suggest that the two churches are rivals, of course, and Wymondham Abbey's high Anglo-catholicism is a match in liturgical terms for the gentle liberalism of the Catholic Diocese of East Anglia. Confusingly, there is another surviving medieval church building in Wymondham which was also dedicated to St Thomas of Canterbury. This is now the public library. 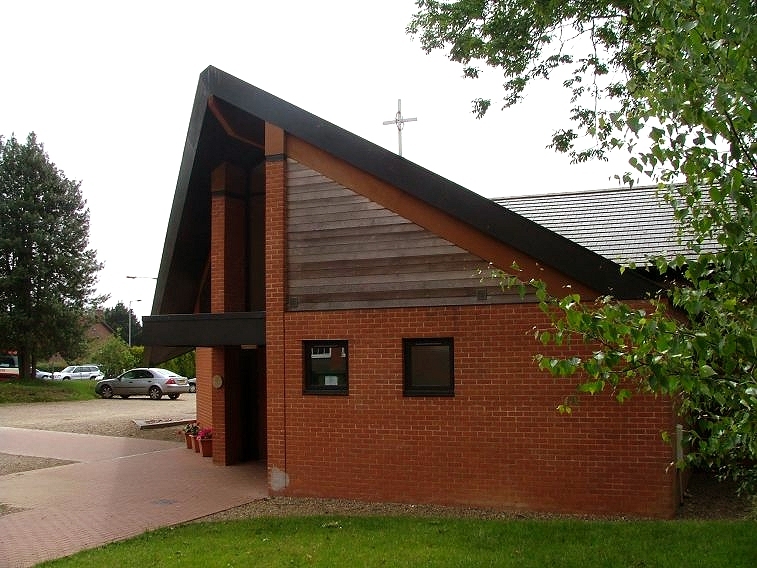 Wymondham Catholic church is where the road to Norwich leaves the town centre. It is a building of two halves. The westerly part (the building is liturgically back to front) is a fairly standard post-war hall church, with lancet windows and a shingle roof. This replaced an earlier building on the other side of the town centre, which, from pictures, appears to have been a much more interesting building than its 1950s replacement. 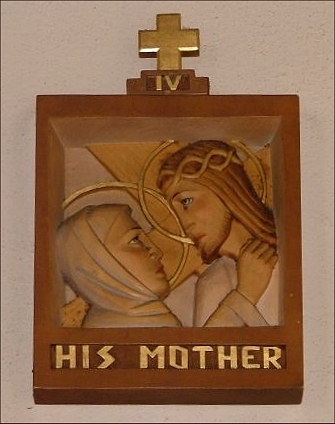 Its dedication was the Holy Name and St Thomas of Canterbury. Presumably there were plenty of local Mass centres during the long penal years, but the Catholic Church had come back properly to Wymondham as late as 1912. The town was on the circuit of centres visited by the 'motor chapel', a travelling mission from St John the Baptist in Norwich, now the Cathedral. 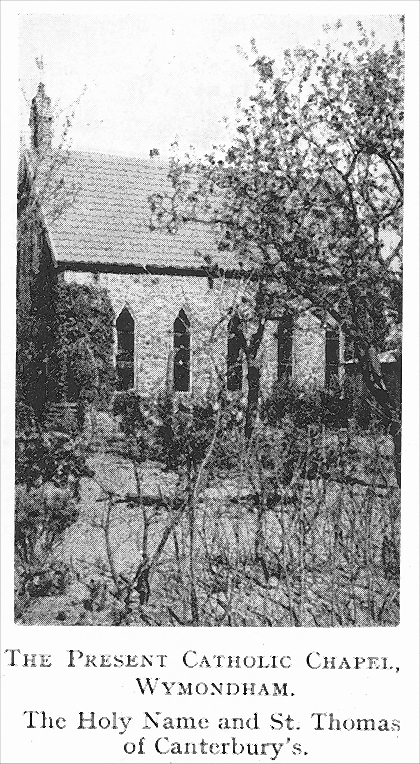 A strong need for a permanent presence was recognised, and the first church was donated, a chapel on Town Green near to the Methodist church, on land belonging to a Mr Glasspool. A Great Gothic Fane records that Mass was said there for the first time on the second Sunday after Epiphany 1912, the Feast of the Holy Name, by one Father Hughes. 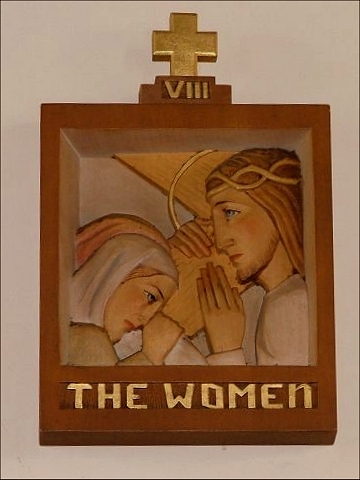 The congregation numbered about forty, of whom only a quarter were Catholics - a far cry from today, when the modern church has a regular Sunday Mass attendance of just under four hundred. 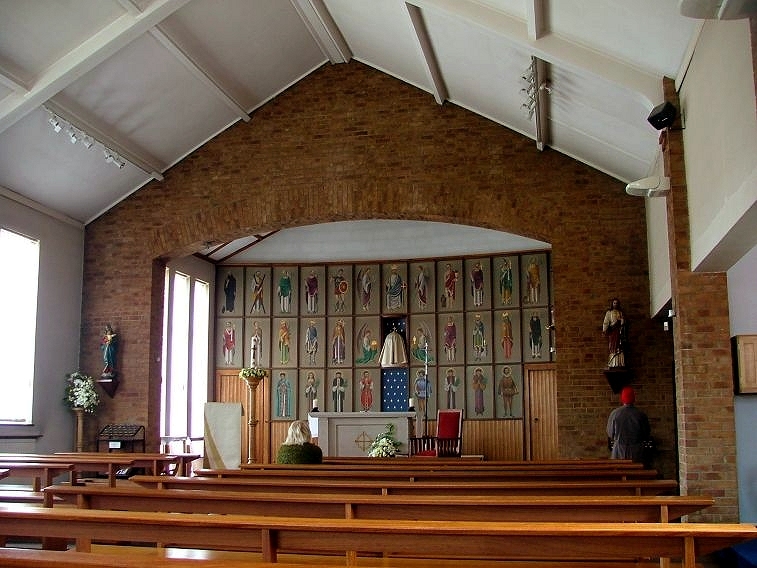 Why was the replacement 1950s church built? I'd like to find out. Probably, the original chapel simply wasn't big enough. Perhaps it had something to do with the availability of the new site in the centre of town on the main road from Norwich, rather than on private land. And perhaps the size of the site, and its potential, was the reason, and a more ambitious church was planned. 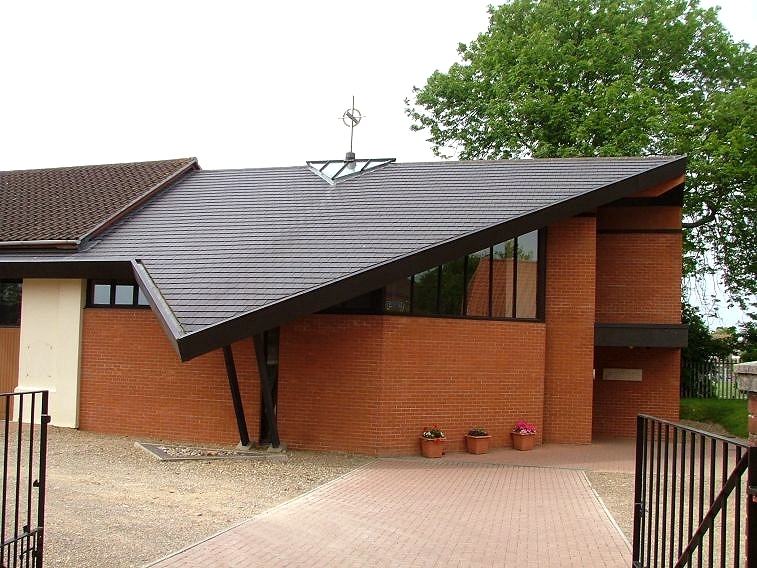 But a little utilitarian hall became the home of the Catholic Church in Wymondham, and so things remained until the 1990s, when one of the most dramatic extensions to a Catholic church in East Anglia was added, doubling the size of the building. 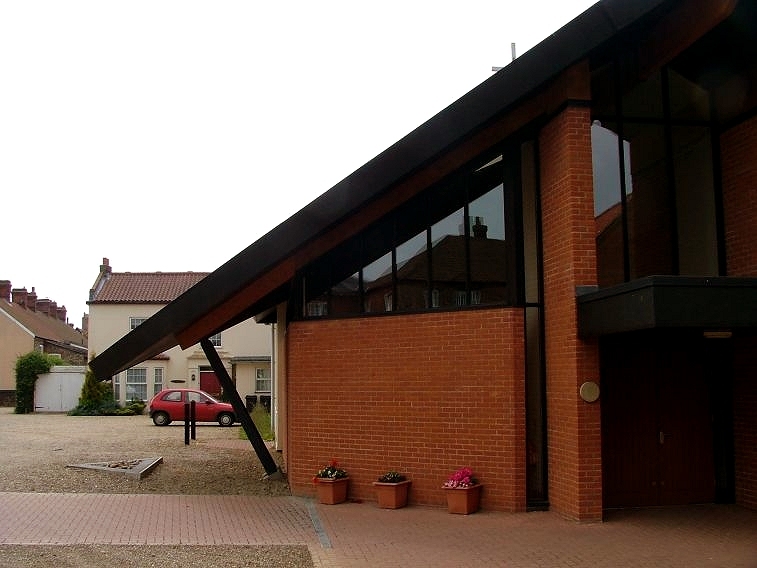 The style is broadly Norfolk vernacular, yet in a post-modern assymetrical style, a substantial red brick building like a barn built by a surrealist farmer, lit by windows in the eastern end and a skylight. And there is a vaguely eastern feeling to it as well, which may be intentional. The roof continues beyond the wall, projecting downwards dramatically to be tied in by a metal girder as if it was the edge of a tent. The entrance is a tall rectangle split in half by a projecting lintel, again very dramatic. You might think that the interior space would simply be a lengthened hall church, but nothing could be further from the truth. It is much braver and more exciting. The old and new structures are separated by a large glass curtain wall, enabling a view right through to the sanctuary from the main entrance, but dividing the internal space into two massive rooms of about equal size. The western room, the original church, continues to fulfill its former function. The eastern room is almost completely empty, apart from a cool, white font set right in the middle. This font is 19th century, and so must have come from elsewhere. Modern office space, a kitchen and toilets open off this eastern room, but the full drama of the space comes from its emptiness. 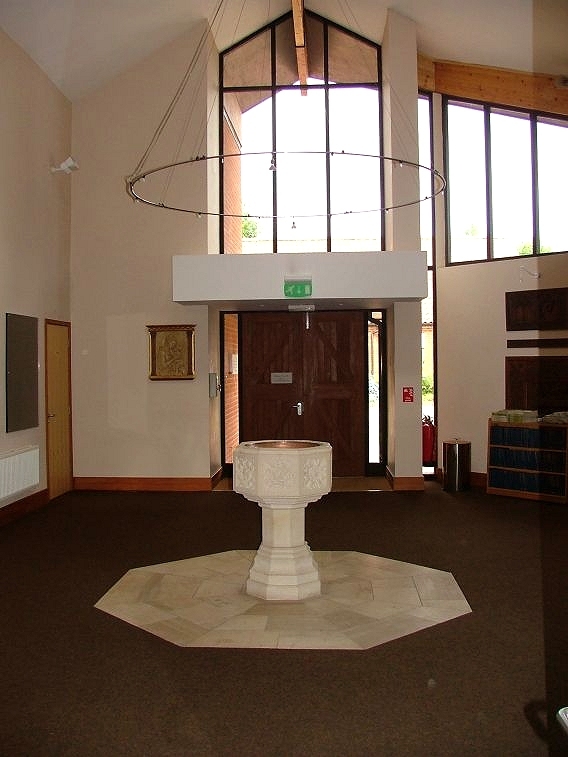 A quiet space, a space for contemplation, and intentionally so, because Wymondham Catholic Church is home to the national memorial to FEPOWs, Far Eastern Prisoners of War. Some relics of those who survived the horrors of the camps are on display here, along with information quietly presented quietly on the walls. It is very moving, particularly for being so simple. East Anglia has a special relationship with the Far East. So many of those who suffered and died in Japanese Prisoner of War camps came from East Anglian regiments. I remember them as a child; old men, who must have been in fact no older than I am now, haunted expressions on their faces and subjects of a village sympathy. The whispered phrases: Changi, and, often, he was on the Railway. Near to my Junior school in central Cambridge there was a large hall with a simple, small sign: FEPOW club. No neon signs to announce its presence like the British Legion, no flag waving and colourful parades. It was almost as though there was a sense of shame about it - no, not that exactly, more a wounded quietness, as though they did not wish to expose or share the burden of their suffering. You step through the glass partition into a more traditional space, the original church. And yet here also, there are beautiful counterpoints to the familiar. 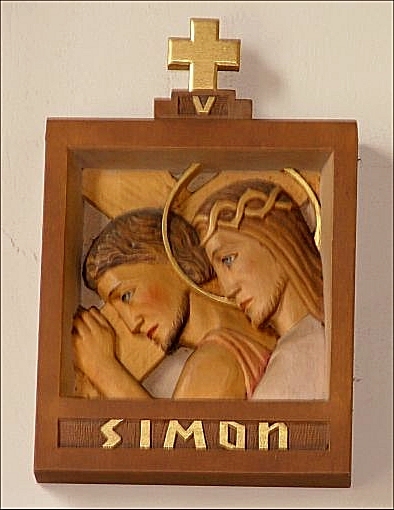 The stations of the cross, for example, are exquisite little lozenges carved starkly and simply, with dramatically brief legends: The Women, says one, depicting Christ's encounter with the women of Jerusalem, and Simon, as Christ's burden is taken from him by Simon of Cyrene. It is always a pleasure to step into a church which is in use. I don't mean one where they're halfway through the main Sunday service, I mean a church that you step into on a weekday afternoon, and find people already in there, lighting candles, saying prayers, making their private devotions. 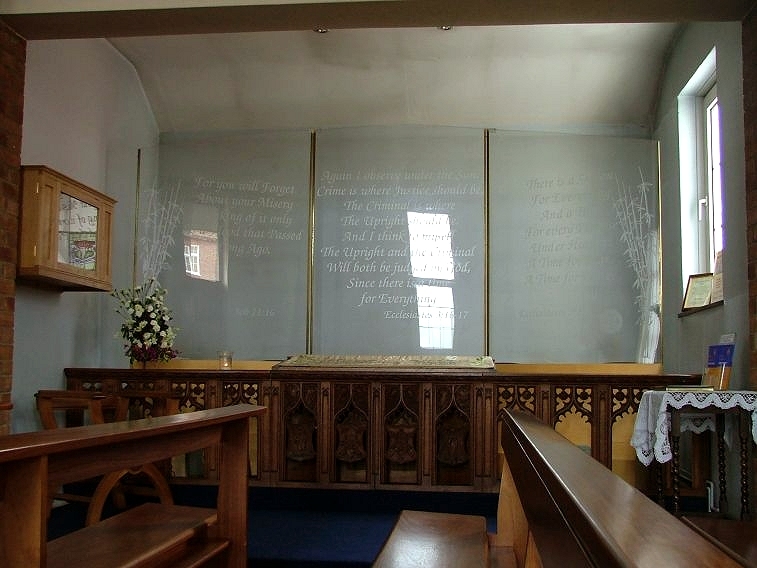 Wymondham Catholic church is like this - I've never been inside and not found someone already there. According to the town website, the church unlocks its doors every morning at 5am, which must make it the earliest opening time in the county; even the Catholic cathedral in Norwich doesn't open until 7am. We stepped inside, and there was the drama of a used space, hallowed for prayer and for action, liturgical and devotional. The sanctuary has a drama of its own. 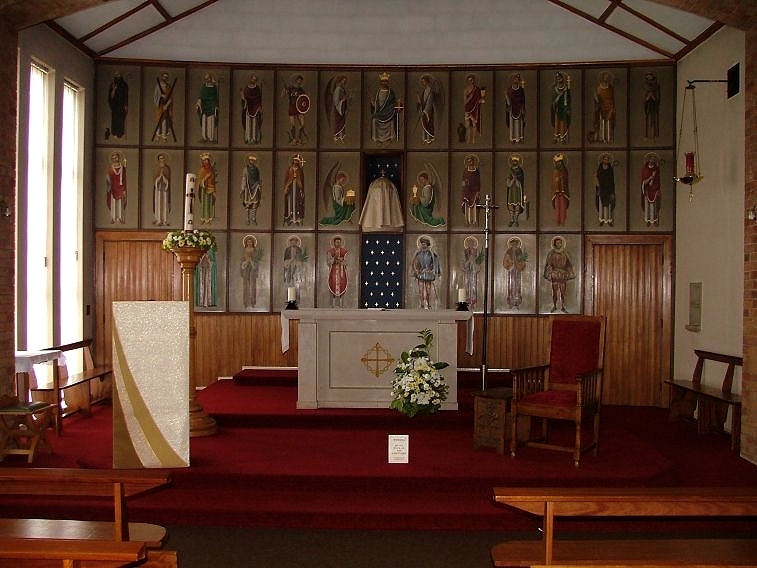 Thirty three Saints are arranged with their symbols on four levels, ranging from Apostles and Evangelists to local Norfolk people. 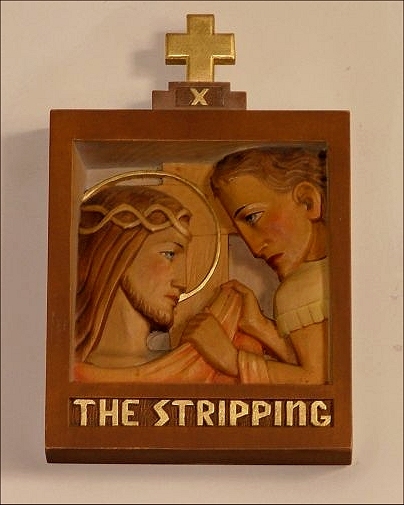 The style is of the 1960s, and so I assume they were painted as part of the church's reordering in response to Vatican II. There are statues to the two patrons on either side of the sanctuary. Again, it is all sweet and simple. About half way down the northern side of the church, there is a small transept, and here is set the FEPOW memorial. It is, at first sight, a curious structure. 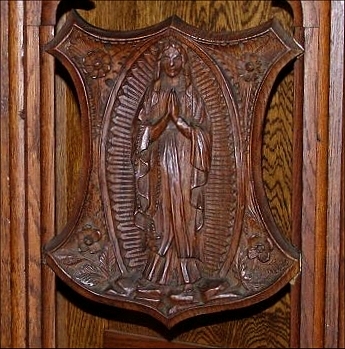 The lower part consists of the original altar rails, presumably from the 1912 church, neatly carved and including a depiction of the Assumption and a swirling Arts and Crafts angel. 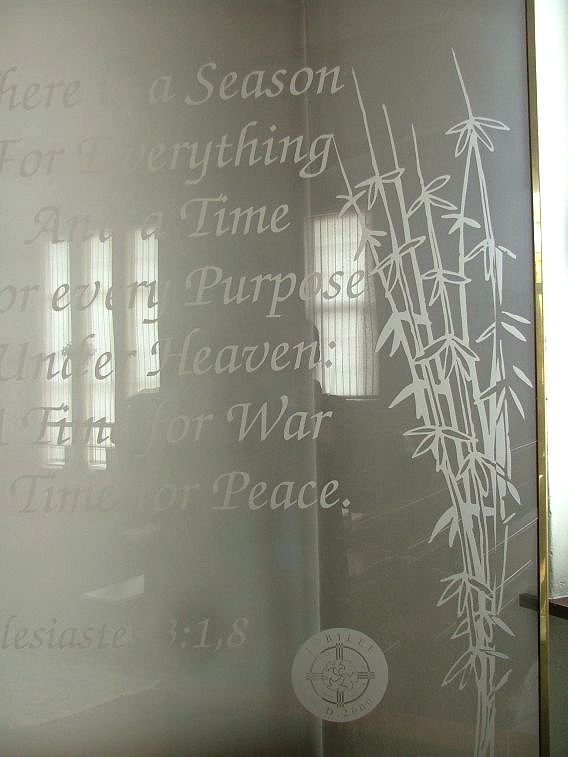 Above, three large glass sheets form a triptych, and they are engraved with words and simple designs, including border decorations of bamboo, evocative of Japan and the Far East. The words include a quotation from the Book of Job: And you will forget your misery, thinking of it only as a flood which passed long ago. Another is from the Book of Ecclesiastes: There is a season for everything, and a time for every purpose under Heaven: a time for war, a time for peace. 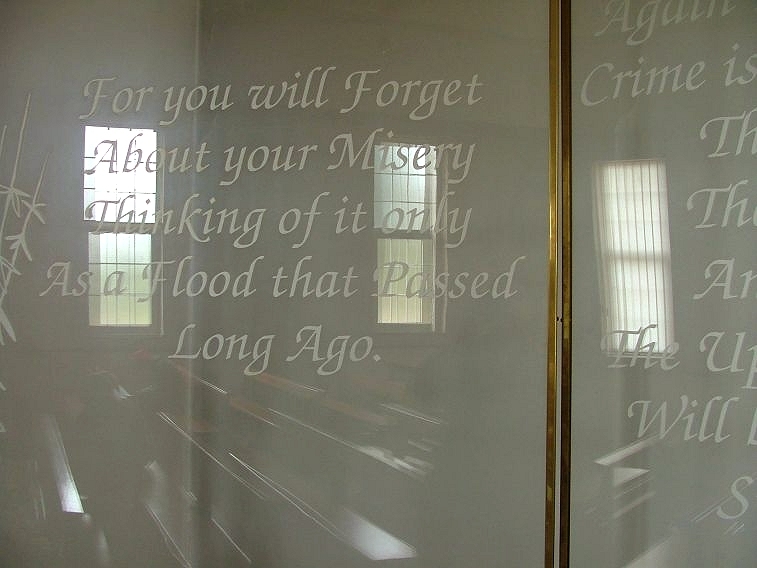 The quiet light and ordinary windows of this older part of the church are reflected back to you as you stand there. I found it very moving. I find it moving still, when I think about it. What is the point of a church? I have pondered this often, especially while making my way around more than twelve hundred Norfolk and Suffolk churches over the last six years. Some churches are locked from one end of the week to the next, existing only as a venue for the activities of the Sunday club. Other churches see themselves as public spiritual spaces, a chance for peace and refreshment for pilgrims and strangers. And then there are the churches that act as a touchstone down the long generations, the folk museums of their respective parishes. And others still are museums of a more formal kind, presenting their history seriously, and yet with a hint of evangelism, as though this sense of the past might be enough to draw you in. 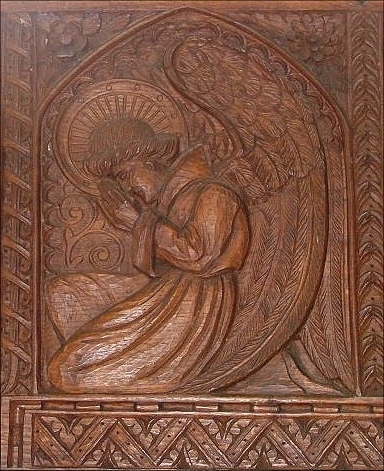 Perhaps the best kind of churches are those which behave as the centre of their parishes, a place to meet, and to enter into a sense of the devotional. I chose Wymondham Catholic church as the 500th entry on the Norfolk Churches site because it is the very model of what I think a church should be. It is open, and active, and prayerful; it is a touchstone, a burr in the memory. 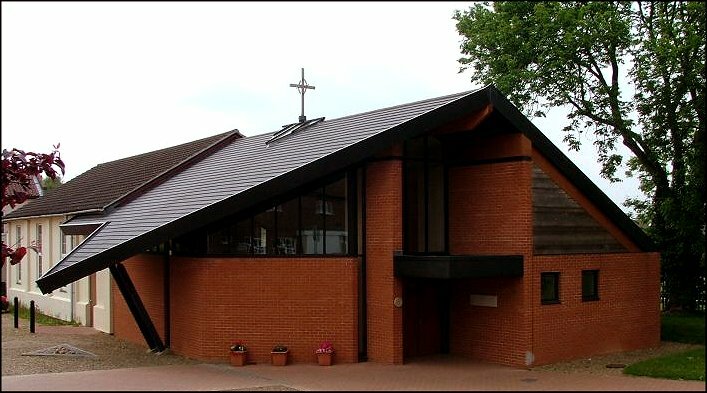 Partly, of course, this is because it is a Catholic church, and all Catholic churches should be these things, although I fear that in East Anglia there are too many Catholic churches which are kept locked from one Mass to the next, and nobody in the Diocese seems to care. 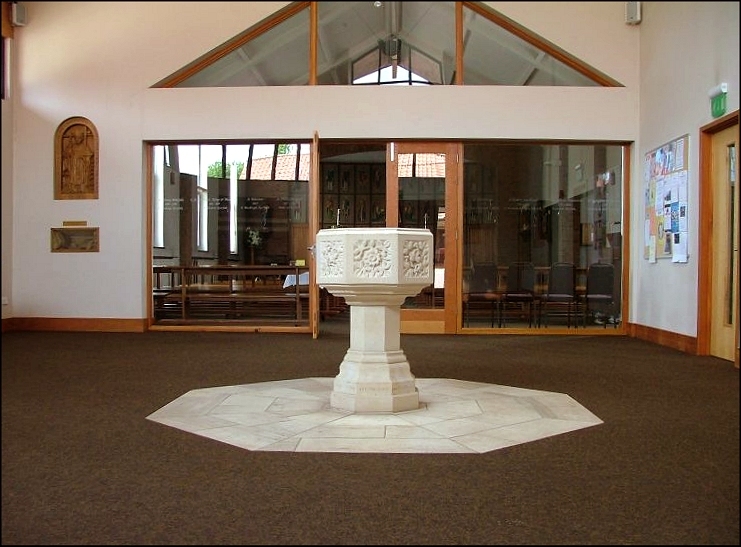 And there are Anglican churches which are as open and prayerful and welcoming as Wymondham Catholic church - I think of South Creake, and St John Timberhill in Norwich, and even Wymondham Abbey, bless it. This pretty little modern church is a model of its kind, to be celebrated, and visited, and entered into and loved.